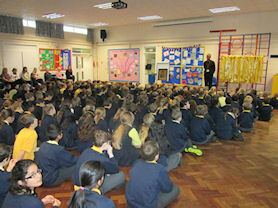 We held a special assembly for Remembrance Day. 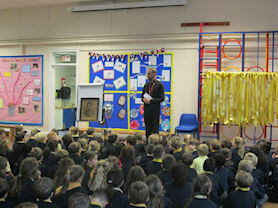 We had a two minute silence at 11.00am, when we thought about all the people who have lost their lives in the war. 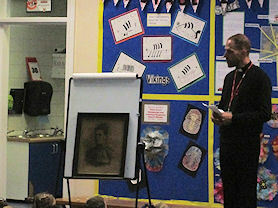 Rev Rhodes told us all about his Uncle who had fought in the First World War. Sadly, he died just before the war ended. He also showed us a yellow ribbon representing 70 servicemen killed in the First World War who were from the area of Maney. Each ribbon had the servicemen's name recorded. We fell silent at 11.00am. Listening carefully to Rev Rhodes. Rev Rhodes told us about his uncle. 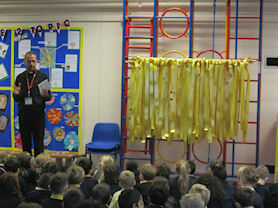 The yellow ribbons represented seventy local servicemen killed in WW1.